Full-length Trailer for The Dark Knight Returns Part 1 DVD. Peter Weller (Robocop) and Ariel Winter (Modern Family) lead the voice cast for Warner Premiere’s animated adaptation of Frank Miller’s iconic 1980s miniseries. 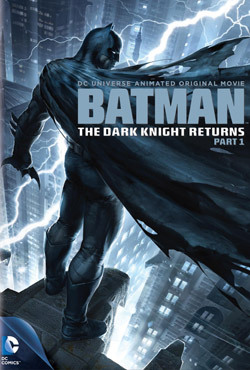 See the DVD and Blu-ray special features and movie trailer for Batman: The Dark Knight Returns Part 1 below. Batman has not been seen for ten years. A new breed of criminal ravages Gotham City, forcing 55-year-old Bruce Wayne back into the cape and cowl. But, does he still have what it takes to fight crime in a new era? MPAA Rating: (PG-13) for some intense sequences of violence and action.